COP 23 venue. Photo taken by Dr. Scott Stephenson. With so many events taking place at the 23rd Conference of the Parties (COP 23) organized by a multitude of diverse actors spanning a range of venues and campuses, one could be forgiven for wondering what exactly the COP is. Is it a political summit? An academic conference? A clean energy tech convention? A global anti-coal demonstration? While it has grown to encompass all of these since its first meeting in 1995, at its heart, the COP serves as the annual meeting of more than 190 parties to the United Nations Framework Convention on Climate Change (UNFCCC). As such, the primary function of the COP is to provide a forum for formal negotiations among official state delegations on a global climate agreement. “But wait,” you might ask, “didn’t the parties already negotiate a global climate agreement at COP 21 in Paris – the Paris Agreement?” Indeed they did – but at that time, the parties essentially signed on to the agreement in principle, with the understanding that the details would be worked out in due time. These details were the focus of the negotiations last year in Marrakech (COP 22) and this year in Bonn. In particular, COP 23 centered on finalizing key details of the “rule book” for implementing the Paris Agreement: who should do what, by when, how, and with what technical and financial support. With this in mind, what were some of the key outcomes of COP 23? Hopes were high among developing countries that loss and damage – those climate impacts that cannot be avoided with mitigation or adaptation – would be enshrined in the UNFCCC process under the Fijian COP presidency. Unfortunately, strong opposition from developed countries such as the US, Canada, and Australia stalled the inclusion of loss and damage finance in the assistance that developed countries will give to developing countries to carry out their Paris commitments. For now, loss and damage seems to have been relegated to further discussion in an “expert dialogue” to be convened in May 2018. COP 23 took steps toward supporting the implementation of gender-related decisions in the UNFCCC process, formally recognizing the importance of gender in climate capacity-building and knowledge-sharing activities. In addition, efforts to advance an indigenous knowledge platform within the UNFCCC gained traction at COP 23, opening the door to increased use of traditional knowledge alongside western scientific ways of knowing (e.g. IPCC reports). Both of these developments strengthen the role that traditionally marginalized groups will play in the negotiations going forward, even if the specific outcomes of each platform have yet to be realized. US Climate Action Center. Photo taken by Dr. Scott Stephenson. In a bold statement of new ambition, Canada, the UK, and 17 other countries committed to rapidly phasing out coal power by 2030. The alliance aims to accelerate the decline of coal in the global energy market in favor of renewable or less carbon-intensive energy sources, and send a strong signal that developed countries aim to deliver on their Paris commitments in advance of the first meeting of the Talanoa Dialogue. It should be noted that the countries currently signed on to the alliance account for less than 3% of coal use worldwide, and do not include the largest coal-users such as China, India, Russia, and of course, the US. Nevertheless, the alliance is significant as an example of “energy diplomacy,” revealing a divide between the US and some of its closest allies in the energy marketplace. Gone are the days when developed countries could be expected to negotiate as a bloc, opposing climate ambition at every turn. Now, a more distributed leadership regime reigns at the UNFCCC, within which developed and developing countries may find their climate priorities aligned in ways that may have seemed impossible before Paris. If the US were to rejoin the Paris Agreement under a new president beyond 2020, it will likely find its leadership marginalized in favor of other states and non-state actors whose activities are now shaping the trajectory of the negotiations for the years to come. Needed on Climate: Ambition, Courage, Realism – with no time to waste. 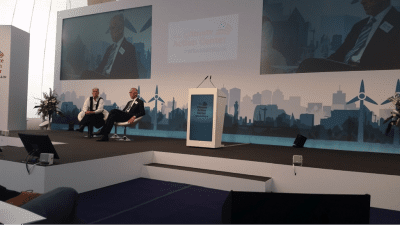 My takeaways from the Bonn Climate Summit. 1. COP23 in Bonn was all about “ambition”. 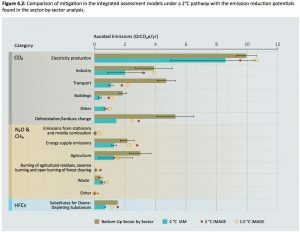 In the 2015 Paris Agreement the countries of the world committed to limiting global temperature increase to “well below 2°C above pre-industrial levels and pursue efforts to limit the temperature increase to 1.5°C above pre-industrial levels”. We knew back then that national pledges made in advance of Paris accounted for only ~1/3 of the emissions reductions required. The Agreement was written with a 5-year review mechanism and transparency that was designed to incentivize increasing national ambition over time. Meanwhile an Emissions Gap Report is published annually as a check up on how we are doing. The 2017 report (see vox article for excellent summary) came out just before the November Bonn UN climate summit. The good news is that greenhouse gas emissions are coming down in Europe and the US. And that China is on board to begin reductions soon. 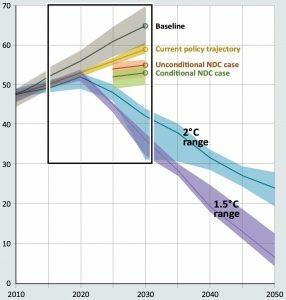 The bad news is that even if we were all wildly successful at meeting the pledges made for Paris, we’d be only 1/3 of the way to the goal for 2030, and worse, emissions are not ramping down as fast as were planned. More Ambition is needed. 2. Carbon pricing is the key to success – and it appears that method matters. Europe, parts of the US and other regions have set up Emissions Trading Schemes (ETS). An ETS places a cap on emissions and allows for trading of emission permits under the cap. In this method the price is determined by the market with the emissions cap specified and reduced over time. This should lead to increasing price of carbon. 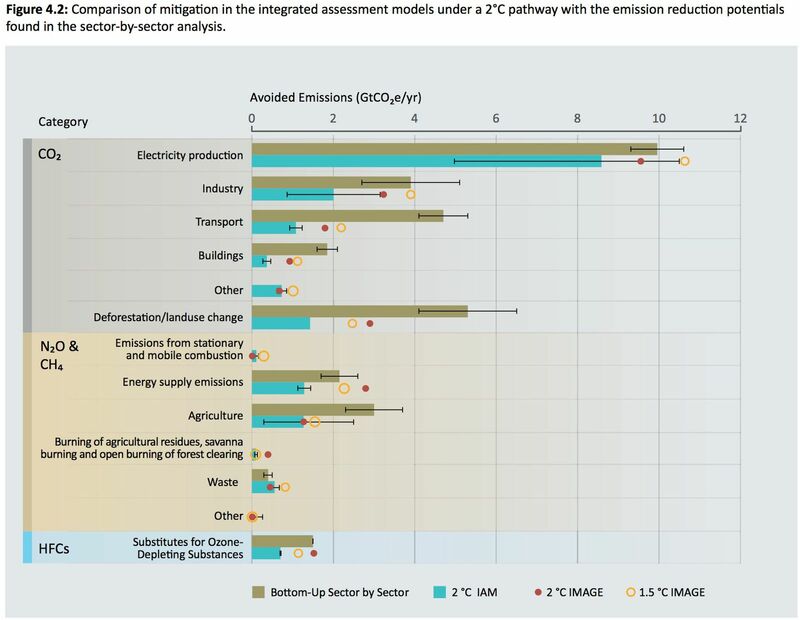 Contrary to this expectation, the experience in Europe (and also in the Northeast RGGI emissions market) has been that the cap can reduce emissions in the sectors to which it is applied, however, the price determined by the market has not increased as required. An economist at the German Pavilion at COP23 explained that traders can benefit more overall if the price of emissions is held low. Whereas the ETS carbon price was expected to be equivalent to that from a rising Carbon Fee, experience in the past decade has shown that trading schemes do not achieve an increasing price on carbon that is needed to transform the economy away from fossil fuel. At the time of this writing the price/ton of Carbon in RGGI is ~$5. The Gap Report estimates a price less than $100 would be sufficient to create an economy wide transition. Still many of the new pricing schemes planned around the world are continuing to use ETS. More ambition is needed. And more courage. 3. In the WASI pavilion we learned that the most progressive US states are finding it most difficult to reduce emissions from transportation. The more fuel efficient we make vehicles, the more we drive them! There is lots of discussion about the future of transportation being electrified and autonomous with shared vehicles. The effect of such a transition on emissions remains unclear, and will depend on the fuel source for electricity as well as VMT. If we need to close the emissions gap by 2030 then we have to find a way to reduce emissions from transport. More ambition is needed. And more courage. And more realism. With no time to waste. In a conference like the UNFCCC, there is a heavy influence focused on the official delegations of the parties. Of course much of the action at any COP is tied into the decision making and discussions within the negotiations. For those of us outside the official zones of negotiation, public spaces become centers of idea trading and demonstration. 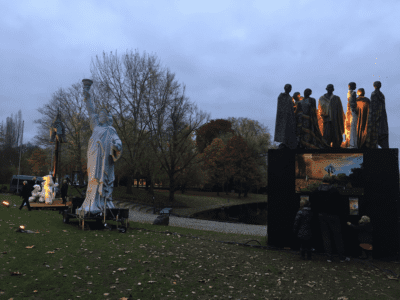 Throughout our days in Bonn, I have seen many ways in which public spaces have been used to communicate messages regarding the proceedings of the conference as well as climate change as a whole. From small signs in the street to a globe shaped cake in the window of a bakery, signs of the climate discussions are all over Bonn. The public presentations I’ve seen are varied in form and impact, but are all important in sharing the voice of people worldwide. 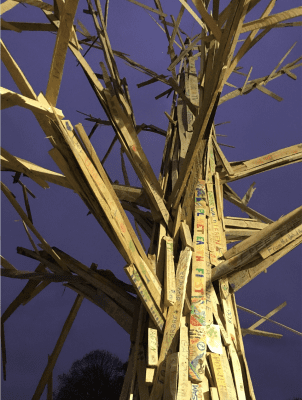 An interactive tree sculpture with messages from the public, part of an exhibit on forestry in Germany. Photo taken by Mary Donato. I find it impactful to see public space used effectively in context of this situation. For instance, the path between the Bonn and Bula Zones contains a long path of open areas in which exhibits are set up and open to the public. These projects included monuments to climate refugees and a life-sized graph depicting carbon emissions as they spike rapidly in modern times. Represented by a pipeline piercing through a polar bear and titled “Unbearable,” the sculpture (which was extended to reflect current emission accuracies while I viewed it) is a striking example of symbolism causing a reaction within the community. In contrast, I find that the interactive and community-based projects are more effective in bringing the climate change issues close to home for a greater audience. In continuing on the path from the Bula to the Bonn Zones, more projects to see and experience were set up. A display of protest signs carrying varying messages all relevant throughout the history of the world were present and created a sense of how the public finds a way for its voice to be heard in a determination transcending specific issues. The creation of a peace blanket and tree sculpture were more interactive projects both including inviting passerby to write a message to be added to the final product. It was obvious to see that such interactive projects are much more engaging to audiences of all ages, and having them available in public spaces allows for conversations surrounding various issues to be open and present for practically anyone regardless of barriers such as language. Sculptures to bring attention to climate refugees and pollution issues, titled “Unbearable.” Photo taken by Mary Donato. Public spaces have a huge impact on life in any location, but particularly a city that is currently full of such a diverse and spirited population. Public transportation, used by many, is a relevant space for providing information and evoking a response. A train station nearby to the UN campus on which the conference is located had an exhibit with beautiful pictures of the non-beautiful realities of lignite mining, a major component of Germany’s energy economy. Large sculptures of “Trash People” brought attention to waste inherent to modern societies. Just outside this train station, public protests on inequality brought further attention to issues being discussed here at COP23. To see all of these public exhibits and presentations made in collaboration across the people of so many nations and backgrounds is amazing. The reactions and discussions created by these items can be seen on the faces of those experiencing them. I know that seeing these public presentations makes me feel that myself and my fellow UConn representatives here at COP23 are in good company in our concern and push for action. We can find hope not only in any progress made in the conference, but also in passionate people all over the globe. One of the things that made my experience as a UConn@COP23 Fellow so memorable was meeting and conversing with like-minded people from around the world. 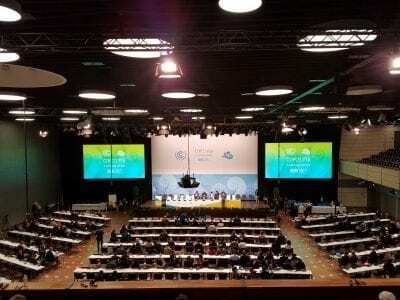 Despite the diverse backgrounds of everyone gathered in Bonn, Germany for the UN’s 23rd annual Climate Summit and Conference of the Parties, it was reassuring and even inspiring to know that so many of us share deep concerns about global warming and even stronger commitments to climate action. But even for an extrovert like me, it was difficult, in the hustle and bustle of navigating public transit between Cologne and Bonn, and attending presentations, workshops, panel discussions and side events, to connect with others outside of my UConn cohort. That’s why one of my favorite activities during the week was the Higher Education Networking Event, co-sponsored by UConn along with Tufts University, Second Nature, and the Association for the Advancement of Sustainability in Higher Education (AASHE). 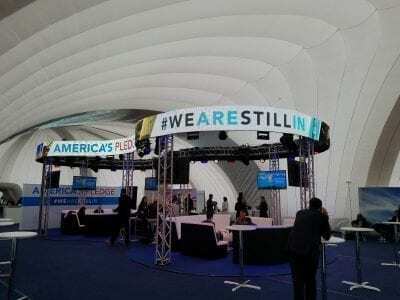 Held on a Tuesday evening, following a busy day of programs and proceedings, the event attracted upwards of 200 students, faculty, staff and friends to the US Climate Action Center in Bonn, also known as the “We Are Still In” Pavilion, which was located alongside the main venue for COP23. With free food and drinks, and music playing in the background, I found great conversation about the environment and sustainability with student peers and others from universities across the country – there was no way this event could have turned out less than stellar. Rich Miller, OEP Director, speaking at the Higher Education Networking Event. Photo taken by Caroline Anastasia. Beginning with opening remarks by Tim Carter, the President of Second Nature, and Rich Miller, a lead organizer of what was now the third annual higher education reception to be held during the UN’s climate summit , the crowd in attendance quickly became aware of UConn’s presence at COP23. As the night progressed, we networked with conference attendees from California to Georgia and Indiana, and even students from France, Germany and Bosnia. I met a graduate student from Yale who worked doing carbon accounting and compiling greenhouse gas inventories for various companies in New Haven. Though we were both about 3,700 miles away from our Connecticut campuses, we made plans to meet again, closer to home, to continue our conversation. I then met a group of students from Indiana University who told me about the higher-level negotiations they had observed that day at the Bonn Zone. Later, I enjoyed talking with several MBA students from Paris who were focusing on sustainability in business. It was very interesting to learn where all the participants at the event came from, and how each of them had incorporated their unique interests in sustainability into their coursework and research. As a junior majoring in Chemistry, these interactions gave me some ideas about how I might do the same. The higher ed networking event was definitely a highlight for me, and I hope that UConn continues to host such a great event at future COPs. Higher Education Networking Event. Photo taken by Colby Buehler. Will the United States Actually Leave Paris? On the final day of programming at the US Climate Action Center two key personnel in securing the Paris Agreement for the United States gave their thoughts on where the US would end up on the accord. After President Trump announced that he intended to leave the Paris Agreement in early June questions about the extent of the withdrawal began to surface. Todd Stern brought up three main options for the US moving forward. The first involves a complete and total withdrawal from the agreement. This process requires some time before it can come to fruition. The agreement locks in countries for five years and even if the President wanted to he could not formally withdrawal for another few years. Sue Biniaz, the former principal legal advisor on the climate negotiations for the United States, and Todd Stern, former Special Envoy for Climate Change in the Obama Administration, explore the future of the Paris Agreement. Photo taken by Colby Buehler. The second path for the US ultimately leads back to joining the agreement. Because the formal withdrawal process requires some time, the next administration could come back in and reverse the decision to leave. 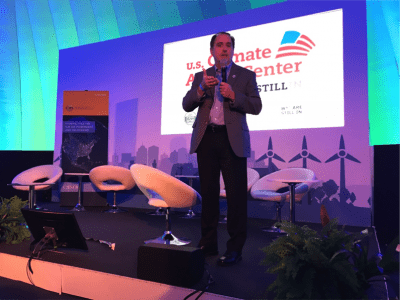 One of the themes of the talks at the US Climate Action Center throughout the week was the volatility of the US and that our word only lasts for four years at a time. Stern warned that even if the next administration immediately reenters the agreement the damage would persist. The final option Stern explored involves the US staying in Paris but lowering our targets. In the Paris Agreement each country voluntarily sets their own targets for reducing emissions. If the Trump administration views the targets as too high they can come back to the table at future COPs to lower the target goals without facing penalties. While this would show a lack of leadership and might encourage other countries to relax their own goals, this would keep an American presence at the table. In terms of the amount of effort involved, Stern argued that the third option would be the easiest which might encourage the Trump administration down that path. While I wish we did not need to concern ourselves with these matters, I hope that the US remains in the agreement in one way or another. The United States disproportionately contributed to climate change and we should play a lead role in trying to remedy the situation. I agree with Stern that if this administration wants to limit US involvement in the Paris Accord, we should lower our targets rather than leave entirely. Keeping a place at the table is far too valuable to give up for simply appealing to the administration’s base. Based on the logistics of withdrawing from the agreement I believe we will end up staying in the agreement for better or worse.